At Tribal Muse you will find unusual vintage tribal jewelry and new ethnic jewelry pieces from around the world. You will find Tibetan, African, Afghan, Kuchi, Turkmen (Turkoman), Berber, Tuareg, Native American, African, and Peruvian jewelry - and even a few more. Tribal beads and textiles too! All at great prices. Fully certified and made in the USA by Navajo, Zuni, and Santo Domingo (Kewa Pueblo) jewelry artisans - Tribal Muse has a great selection of stunning Native American Indian jewelry. You will find lots of unusual one-of-a-kind Himalayan, Nepalese, and Tibetan jewelry at Tribal Muse - your global marketplace for tribal jewelry from around the world. Turkmen (Turkoman) tribal jewelry - antique, vintage, and new pieces that are loaded with heritage and symbolism. Find a large selection of Afghan, Uzbek, and Kazakh jewelry here too. African Tribal Jewelry from all over the continent. Fair Trade Jewelry from Peru that is beautifully handcrafted. 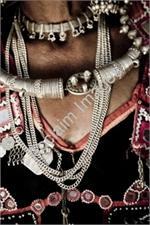 Vintage Kuchi Tribal Jewelry, including necklace, headpieces, earrings and more from the Kuchi tribes of the Old Silk Road trade routes. great for wearing, belly dancing, and collecting. Contemporary Turkish Jewelry that captures the Tribal Spirit. All of our Turkish Jewelry is made in Turkey - nowhere else. Tribal Jewellery that doesn't quite fit in our other categories! Odds and ends of Tribal Jewelry from around the world, including souvenir, tidbits, and irregular pieces at discounted prices. Sold as-is at a great price.